Unfortunately the "Free Swiss Miss Hot Cocoa" offer is no longer available. Hunker down on a cold day with a hot cup of Swiss Miss instant cocoa, topped with whipped cream, marshmallows, or accented with a dash of peppermint for an indulgent treat. 3. 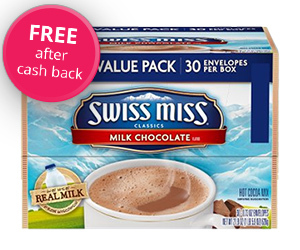 Add one (1) Swiss Miss Milk Chocolate Hot Cocoa Mix Envelopes, 30-Count to your cart and checkout. Do not add anything else to your cart. 5. In about 14 days 100% cashback will post in your TopCashback account.